Effective ADHD Interventions: Is blue light syndrome impacting ADHD? Each year billions of dollars are spent in the US trying to improve the experience of children with ADHD and their parents. But one of the simplest and most effective ADHD interventions is often neglected. One in ten American children aged 5–17 years has been diagnosed with ADHD, with boys more than twice as likely to be diagnosed as girls. The hyperactivity, impulsiveness and attention problems can be quite disruptive to the kids, their homes, and their classrooms. The great majority of children diagnosed with ADHD are treated with prescription medications. It’s not clear that this is a great long-term solution, with potential unintended effects on young children as well as decreasing benefit over time. The American Academy of Pediatrics recommends, and I agree, that before prescribing prescription medication, parents of young children with ADHD be referred for training in behavior therapy. But only about half of children with ADHD receive psychological services. The recommended first treatment for ADHD is underused. Poor sleep can mimic ADHD. Some children display all of the impulsiveness and poor attention of ADHD, and are diagnosed, when the real problem is that they are not well rested. Poor sleep can make true ADHD worse. For these kids, improving sleep can decrease hyperactivity, impulsivity, and inattention, reducing the need for medication. Getting sleep right should make other treatments, whether medication or behavior therapy, more effective. ADHD and its treatment can worsen sleep. These kids also need their sleep addressed to reap a host of benefits at home and at school. Restorative sleep depends on the circadian rhythm, our body’s tide of hormones, which includes melatonin. The circadian rhythm and the release of melatonin is regulated by several cues from the environment, most notably from sensors in the retina containing melanopsin that are tuned to a blue wavelength of light found in many white-looking artificial lights and screens. Blue light syndrome is the constellation of symptoms caused by the disruption of the circadian rhythm by this wavelength of light. It includes the symptoms of ADHD. Artificial lights and bright screens in the evenings are lurking in the family rooms and bedrooms, and the hands, of millions of kids. I believe this has contributed to the recent dramatic rise in the diagnosis of ADHD. The very kids who are driven to distraction are often the same ones whose eyes are glued to their screens or whose lights stay on long into the evening. 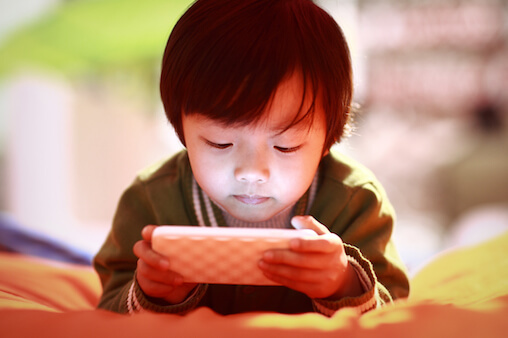 Click here to take control of the lights in your home and the lights on your child’s screens. To me, every child diagnosed with ADHD or suspected of having ADHD deserves thoughtful consideration of their sleep and of the devices in their home that affect it. This would represent a simple but radical change. While I’m grateful for the existence of prescription ADHD medications, I would be far happier if no new ADHD prescription were ever written again without first considering sleep quality and behavior therapy training. CDC, 2015. Percentage of Children Aged 5–17 Years with Diagnosed Attention Deficit/Hyperactivity Disorder (ADHD). Morbidity and Mortality Weekly Report (MMWR). October 16, 2015 / 64(40);1156. CDC, 2016. More Young Children with ADHD Could Benefit from Behavior Therapy: Behavior therapy recommended before medicine for young children with ADHD. CDC Newsroom. CDC, 2016. ADHD in Young Children. CDC Vital Signs. Chang, A.-M. et al., 2014. Evening use of light-emitting eReaders negatively affects sleep, circadian timing, and next-morning alertness. Proceedings of the National Academy of Sciences, 112(4), p.201418490. Cortese, S., 2015. Sleep and ADHD: What We Know and What We Do Not Know. Sleep Medicine, 16(1), pp.5-6. Gooley, J.J. et al., 2011. Exposure to room light before bedtime suppresses melatonin onset and shortens melatonin duration in humans. Journal of Clinical Endocrinology and Metabolism, 96(3), pp.463–472. Lockley, S.W., Brainard, G.C. & Czeisler, C.A., 2003. High sensitivity of the human circadian melatonin rhythm to resetting by short wavelength light. Journal of Clinical Endocrinology and Metabolism, 88(9), pp.4502–4505. Owens J.A., 2006. The ADHD and sleep conundrum redux: moving forward. Sleep Med Rev, 10: pp. 377-379. Good morning Dr. I am 30yrs old and a Nursing Graduate, not yet registered. I am looking at taking Pediatrics and become a doctor. How long would it take me more and what are the struggles? Dr. Greene has written an answer to your question. You can see it here –> The Journey to Become a Pediatrician. Thanks Alan. So glad you are using Face Book to reach parents. Address the sleep issues first. I also wonder about the blue light effect on Seniors sleep patterns and relationship to dementia etc. Great to hear from you and great questions about seniors. Dr. Greene bought his parents a special light for their room to provide blue light during the day and take out blue wavelengths at night. I guess GMTA!